There were a lot of great things at our local farmer’s market this past weekend. I typically buy things that I may or may not know what I am going to use. Maybe that is a challenge, who knows, but the recent visit I bought a bunch of great potatoes, leeks, and garlic, among a few other items. When I was looking at the produce, I figured I would make a big batch of soup. The weather was getting a bit cooler, so I figured this would be a great time for a nice comforting soup. That’s when the idea of a nice creamy potato, leek, and chicken soup came to mind. Heck, I was probably thinking I wanted a loaded bake potato soup, or a leek soup, or chicken noodle soup, so I decided to bring them all together for the most part, and I’m glad I did. This soup rocked and impressed my soup eaters, that for sure. Start by adding the butter to a stock pot, and melt it on medium heat. Once melted, toss in the sliced leeks. Make sure you wash the leeks after slicing as a bunch of grit typically remains in the leeks. Cook the leeks for about 5 minutes, or until they are nice and tender. Season with salt and pepper, then add in garlic, cooking another couple of minutes. Add in the cooked potatoes, sprigs of thyme, and stock. Bring to a simmer and cook for about 20 minutes. After 20 minutes, remove the sprigs of thyme and discard. Now you have a couple of options at this point. You can blend this mixture in a food processor or blender, or if you have an immersion blender, use that. Blend until you have a smooth mixture, then return back to the stock pot and cook on low. Add the shredded chicken, and continue to cook for an additional 20 minutes. Taste and season with any additional salt or pepper. Ladle into a soup bowl, and garnish with pickled chilies if you desire (I prefer). The end result is nothing but pure comfort. 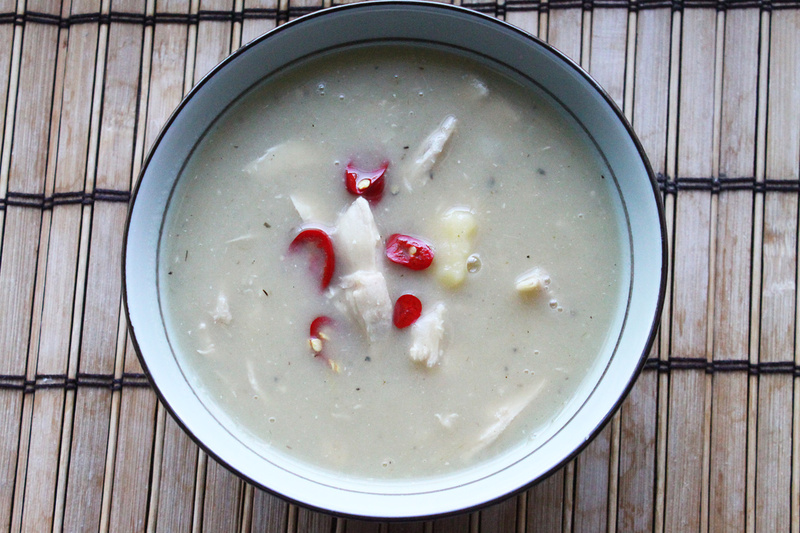 The smoothness you get from the soup is perfectly balanced by the shredded chicken, and if you are using any type of pickled chilies, then it gets even better, not only from the heat, but it cuts through some of that awesomeness. 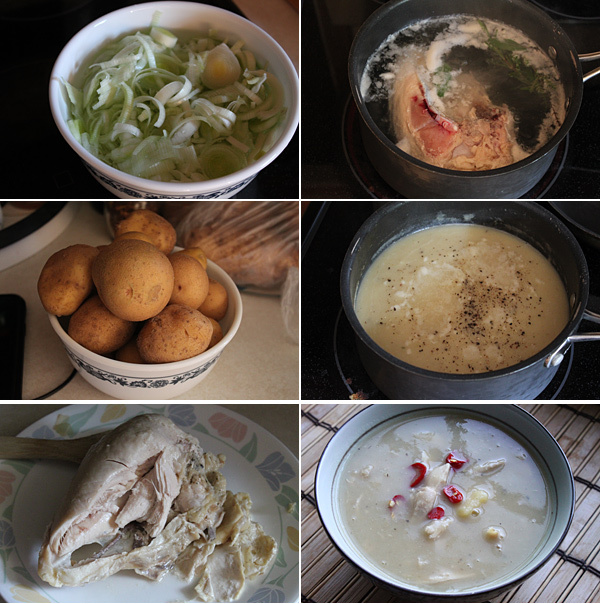 Plus, this soup, as noted, brings out the best of all three soups. I hope you enjoy! just wanted to let you know, i love these recipes, and once my son returns home, we will be sampling almost everything. Barbara, Thanks for the great comment! I hope you enjoy.